Owen’s story went viral, and he raised $141,000 to attend Georgetown. The story of Seth Owen went viral earlier this year when the openly gay, high school valedictorian was kicked out of his house for being gay, cut off from his parents financially, and unable to afford college. The Jacksonville, Florida native was sent to conversion therapy after his father searched through his phone and realized that his son was gay. His parents then gave him an ultimatum: continuing going to a church that discriminated against LGBTQ people or leave home and be cut off. He chose the latter. Seth’s biology teacher and mentor, Jane Martin, created a GoFundMe page for Owen when Georgetown initially refused to change his financial age package, and Seth was $20,000 short to attend. The page raised a whopping $141,000 total. Subsequently, Georgetown University gave Owen a full scholarship. 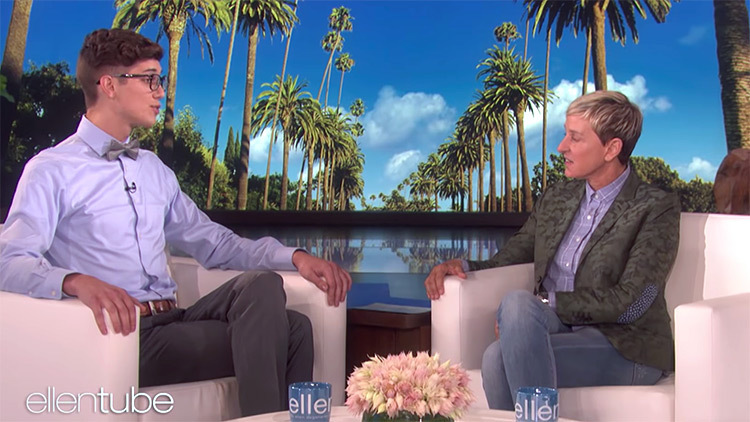 Yesterday on the Ellen Show, Seth spoke about what he plans to do with the rest of the money he raised: create a scholarship program for LGBTQ youth. In classic Ellen fashion, the talk show host had a big surprise for the young man. She gave Seth $25,000 to help start raising donations for his scholarship program. Check out the original story here: Out Magazine.